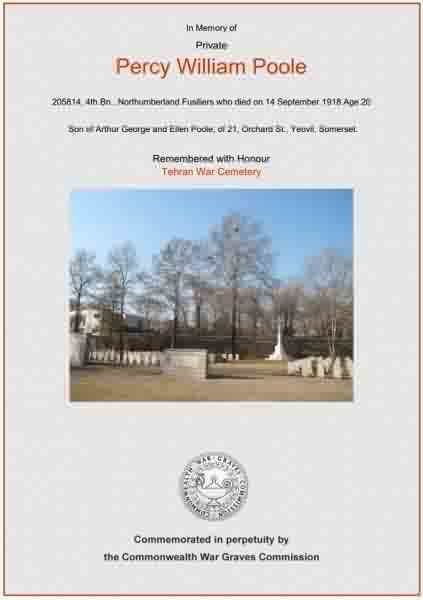 William Percy Poole, known as Percy or Percy William, was born in Yeovil in 1898, the elder son of carpenter and joiner Arthur George Poole (1872-1953) and Ellen nee Hull (1871-1947). 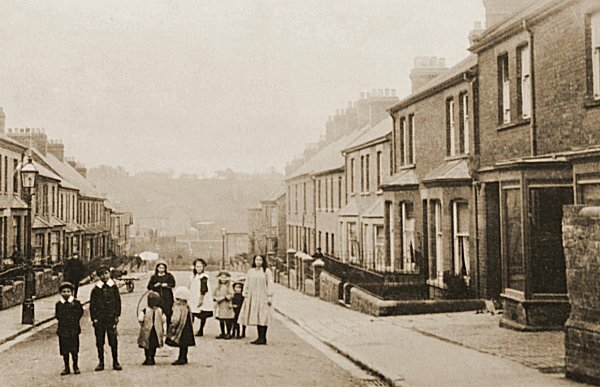 In the 1901 census Arthur, Ellen and Percy's 5-month old brother Maurice were recorded living in Orchard Street while Percy was staying with his grandparents in East Chinnock on the night of the census. In the 1911 census the whole family, including Arthur's parents George and Sarah Ann Poole, were listed at 21 Orchard Street. Arthur gave his occupation as a builder, while both Percy and Maurice, aged 12 and 10 respectively were still at school. Percy enlisted at Taunton, although the date is unclear but likely to have been during 1917. He initially enlisted as a Private in the the Somerset Light Infantry with the Service Number 2915 but was later transferred to the 2nd (Garrison) Battalion, Northumberland Fusiliers with the Service Number 205814. This battalion was formed in October 1915 at Newcastle and went to India in February 1916. Cecil's whereabouts are somewhat uncertain since the 2nd (Garrison) Battalion, Northumberland Fusiliers joined the Sialkot Brigade, 2nd (Indian) Division and between March 1916 and March 1917 in the 6th Poona divisional area. From March 1917 until October 1917 the battalion remained with the Division but at Ahmednagar. Then from October 1917 to May 1918 it was transferred to the Ahmednagar Brigade. However, some men of the 2nd (Garrison) Battalion Northumberland Fusiliers, including Percy Poole, served in Mesopotamia from March 1917 until 1919. Whether this was the whole battalion, or elements of it, is not clear but the Battalion lost 179 men during the First World War and the majority died from sickness in Mesopotamia. It seems certain that all or part of the 2nd (Garrison) Battalion Northumberland Fusiliers arrived in Basra in late February or early March 1917. The deaths in Mesopotamia appeared to be mostly from sickness. The Garrison Battalion of the Northumberland Fusiliers appears to have remained in Mesopotamia until the winter of 1918. Percy died of enteric fever on 14 September 1918, at Basra Hospital. He was aged 20. Percy was interred in Tehran War Cemetery, Iran, Grave V.D.9. His name is recorded on the War Memorial in the Borough. For details of Percy's brother Maurice, who died on 25 June 1919, - click here. The Commonwealth War Graves Commission certificate in memory of Percy Poole.